The GoPro camera doesn’t resemble a conventional camcorder, nor does it behave like one. It looks more like a small square box with a protruding lens than a sleekly designed camcorder. Although you can hold it like a traditional camera, it is equally effective (if not more so) when it’s attached to something. Size: The current GoPros are quite small compared with most camcorders and significantly smaller than their predecessors. Most models don’t have a viewfinder: Though the viewfinder is one of the main parts of a camcorder, only one current GoPro includes a viewing screen. That’s okay because you wouldn’t look through a viewfinder for most situations. The lack of a viewfinder doesn’t mean you have to imagine where the action will take place. Simply use Capture, which transforms your smartphone or tablet into a monitor. Wide-angle view: The GoPro captures an angle of view up to 170-degrees that provides an ultra-wide view unavailable on any camcorder. Just a few years ago, merely having a moderate wide-angle view on a camcorder was a minor coup. Going reasonably wider often meant using one of those poor quality wide-angle adapters that screwed on the filter or clamped over the lens. Adapters produced exaggerated distortion, especially on the edges, creating a foggy appearance. The GoPro provides a wider perspective than those old accessory lenses, as shown, and does it with impressive optical quality. In a way, the GoPro represents the elusive go-anywhere camera that’s everything the camcorder never was: durable, mountable, and affordable. 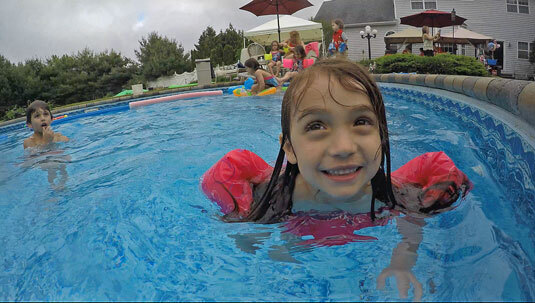 An expansive view from the GoPro’s wide-angle lens taken relatively close to the subject. Waterproof housing: Thanks to its polycarbonate body on the HERO5, (and Session) and plastic housing on other HERO models, you can use your GoPro in, around, and under water. Wearability: Although it’s not the kind of accessory that fashionistas clamor for on the catwalk during Milan Fashion Week, the GoPro is still quite fashionable. You can not only wear it, but also capture some pretty impressive video with it. Chesty: The Chesty harness allows you to transform yourself into a living dolly. Instead of moving the camera through the scene and capturing choppy footage, be one with the camera and move through the scene in Zen-like splendor. Head Strap: The headband attaches to your head so you can get that walk-through look in your video (see Figure 1-4). Hand and Wrist Strap: Allows you to wear the camera on your arm or wrist. Capture timely footage simply by twisting your wrist or moving your arm. Bicycle helmet: Wear the camera mounted on your helmet to get the unique perspective of a cyclist. Seeker: Include mounting options of Seeker backpack. 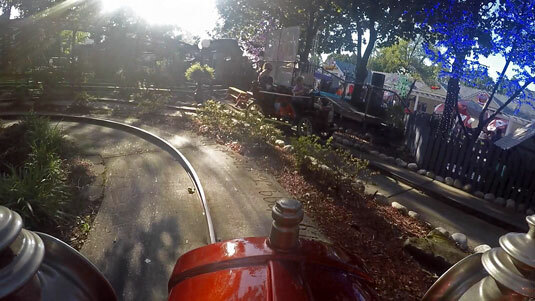 Mounting your GoPro on the Head Strap lets you establish a subjective perspective simply by moving through the scene.